Like the idea of shared dining, but not a great fan of Spanish tapas? Well, try BAR22. Here you can have delicious half-size dishes to share with your fellow diners, without having to choose between tortilla or chorizo. The menu varies from inside-out sushi to grandma’s meatballs to garlic spaghetti. A wide variety of choices. It’s up to you! The drawings on the wall are amazing and give the interior a very unique vibe. It used to be just a bar, and now the focus is mainly on the restaurant. 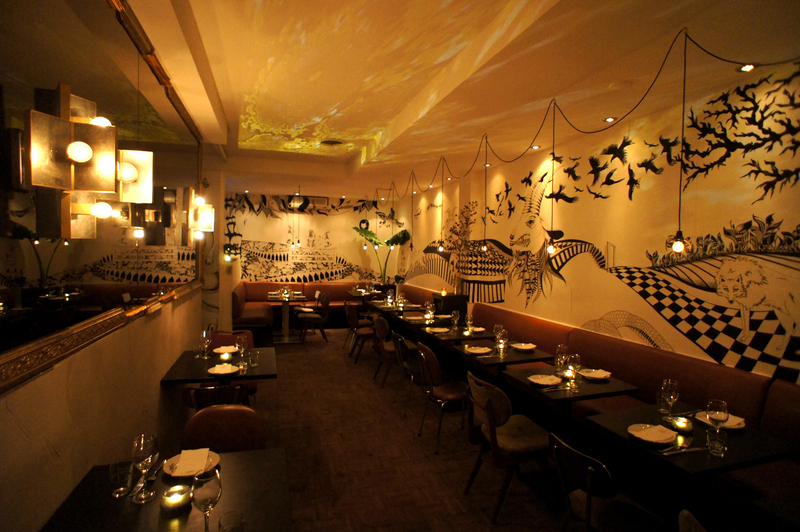 However, you can still feel the cosy ‘bar-esque’ atmosphere: laid-back and unconstrained. And right after dinner, the DJ pops in to select and play music, so that you don’t even have to move on to the next bar down the street. Just stay where you are!